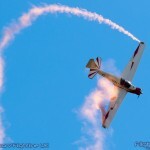 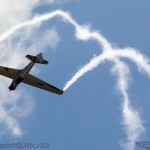 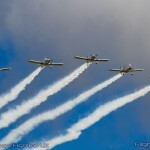 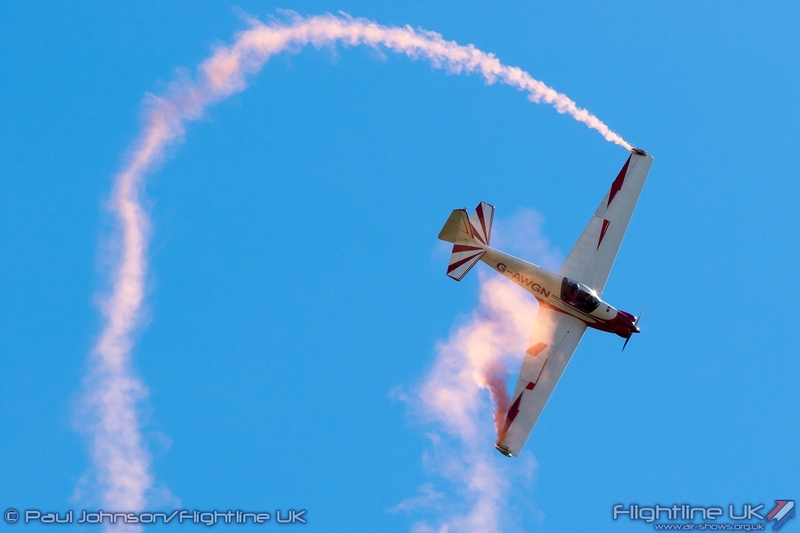 It is always good to see a new airshow appear on the calendar, particularly at a beautiful venue such as Old Sarum. 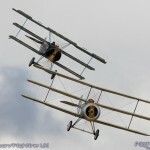 Taking advantage of a gap left by the failure of the Southend Airshow revival, the event brought together many top class civilian display acts for what promised to be a fun weekend of flying in great surroundings. 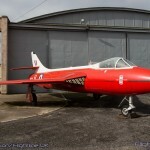 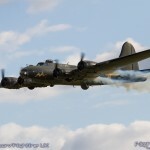 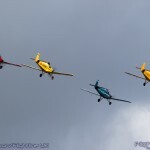 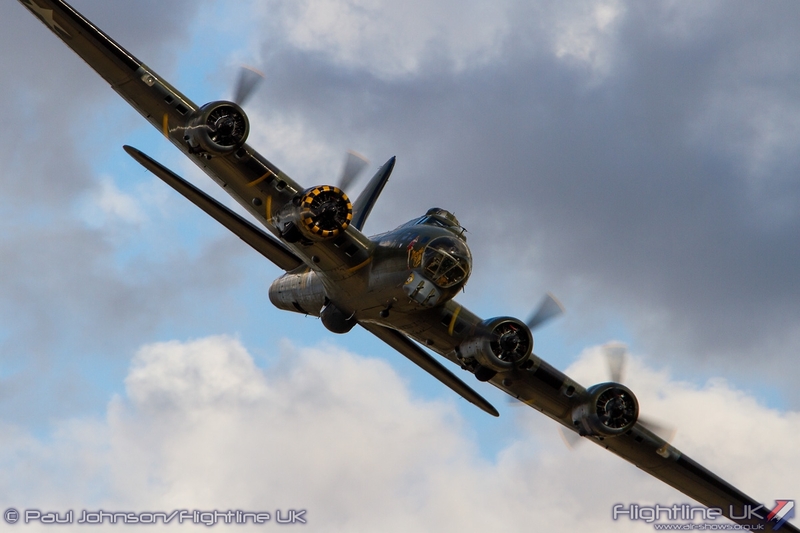 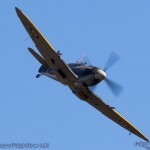 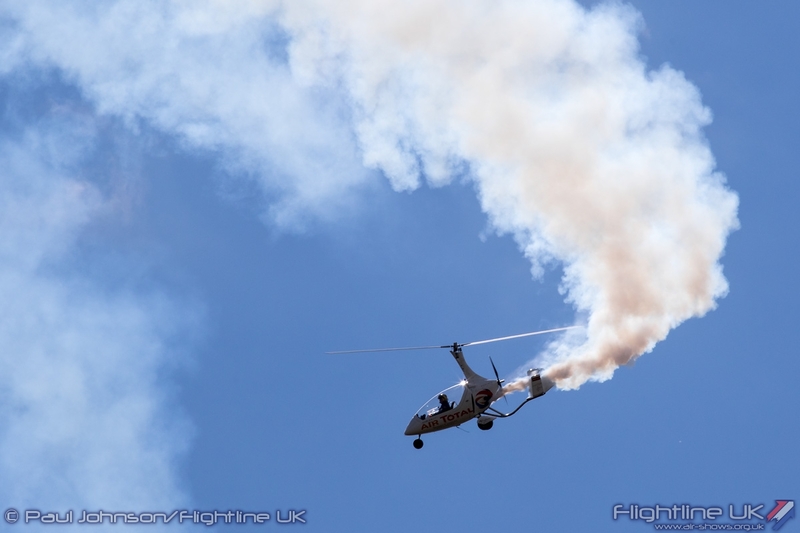 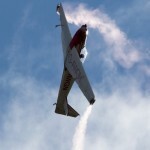 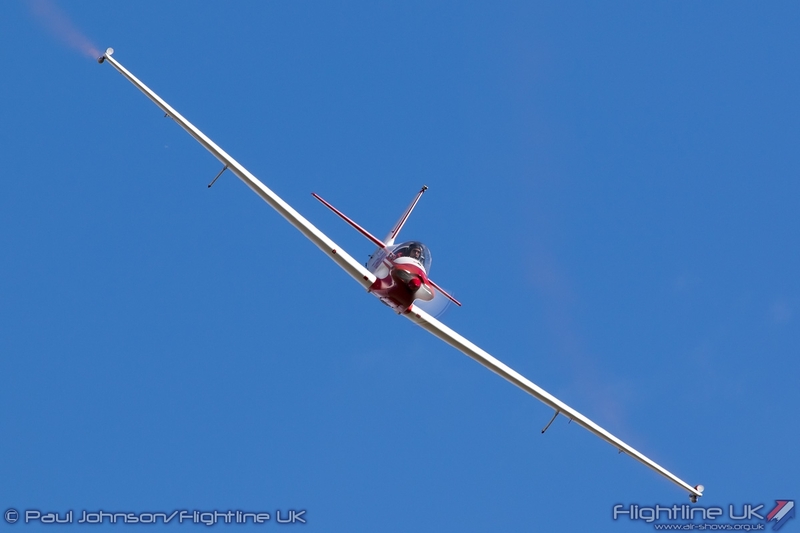 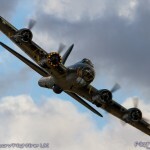 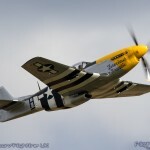 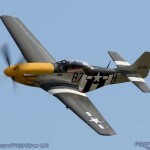 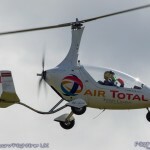 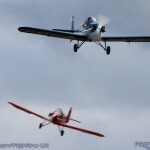 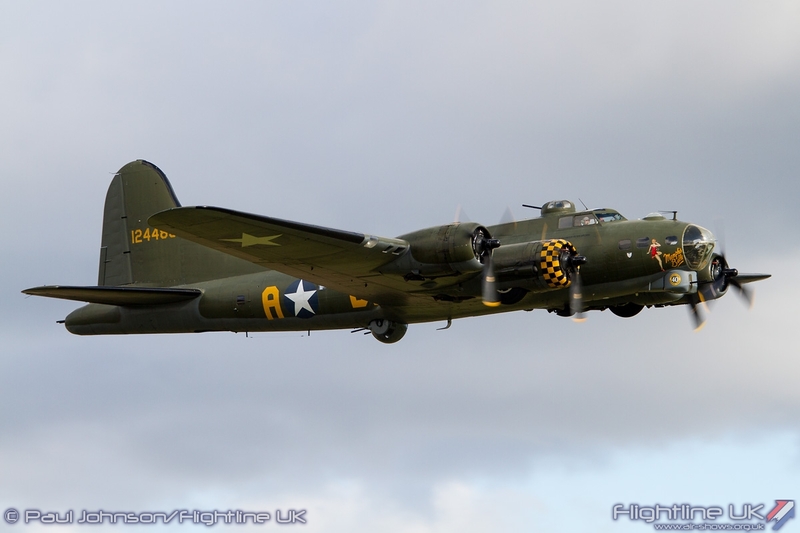 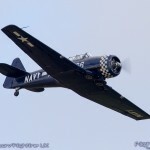 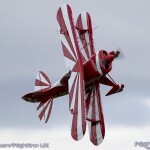 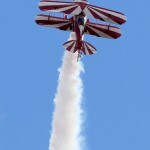 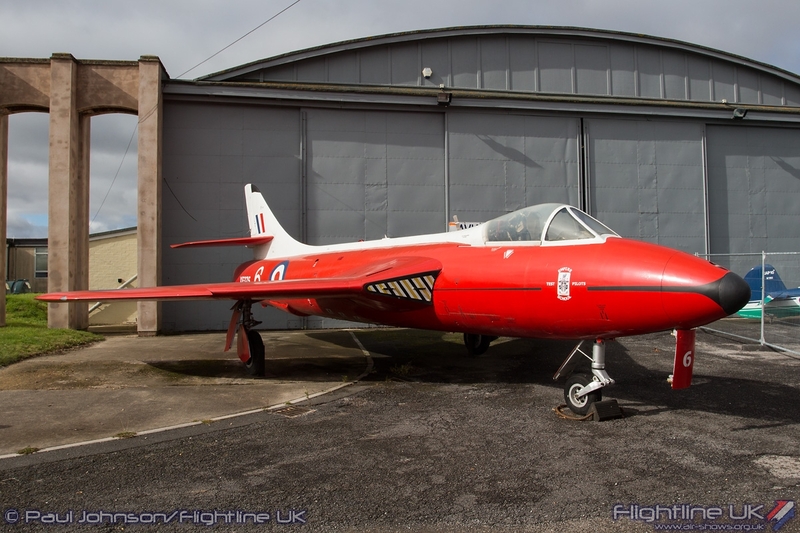 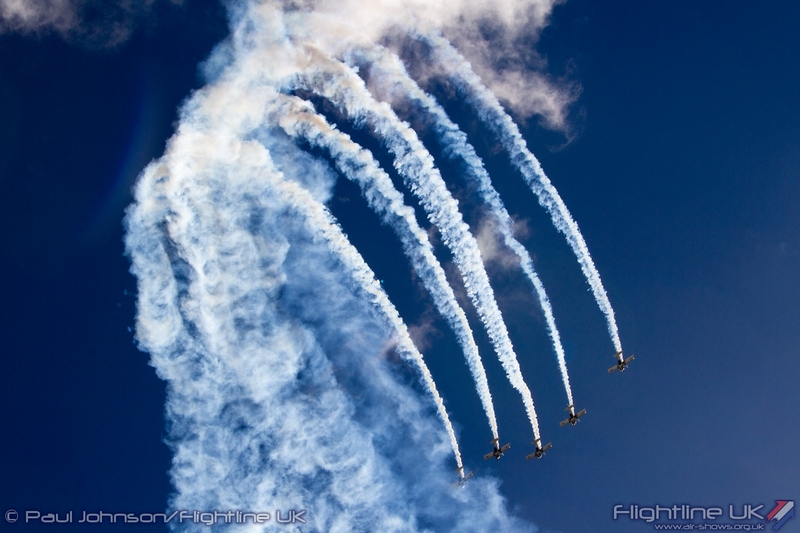 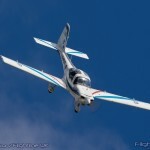 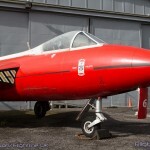 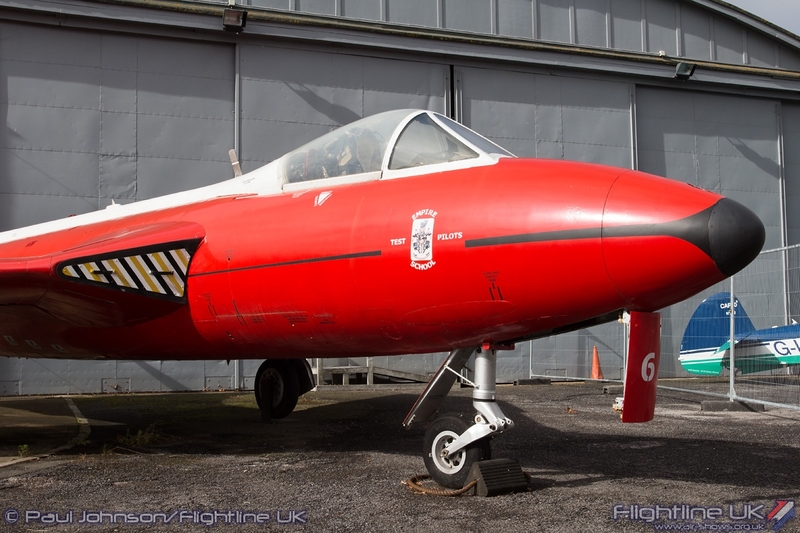 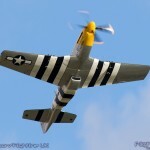 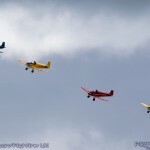 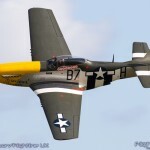 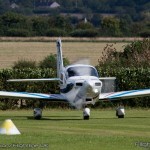 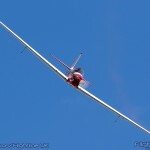 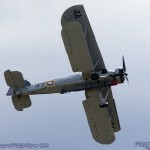 Paul Johnson/Flightline UK reports from the first day of this new event. 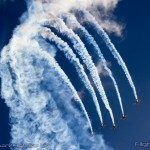 All photography by the author. 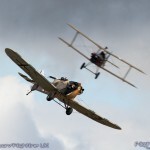 While the Old Sarum Airshow is a completely new event, this was not the first time the beautiful grass airfield had hosted air displays with “Support Our Paras” hosting two events there in recent years. 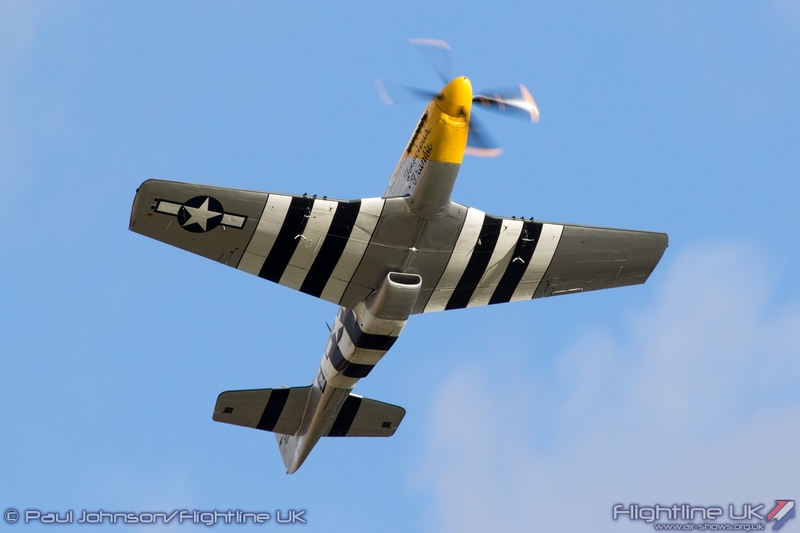 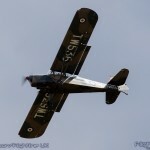 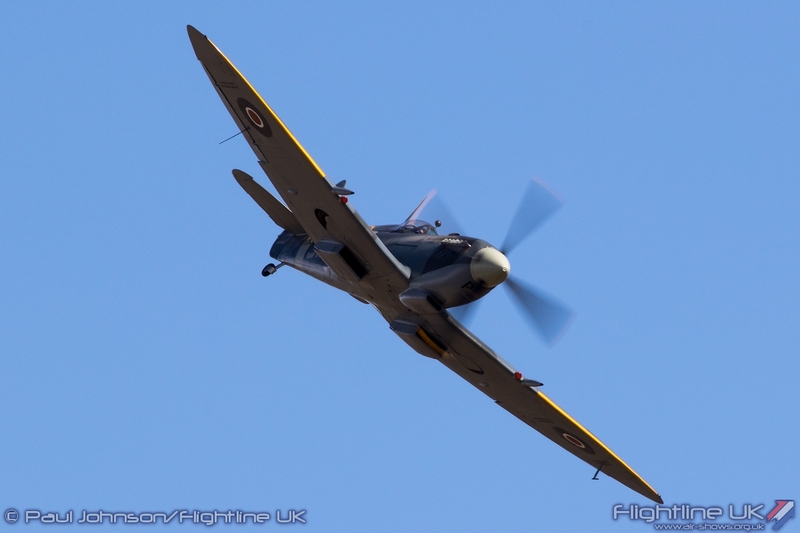 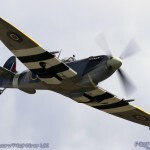 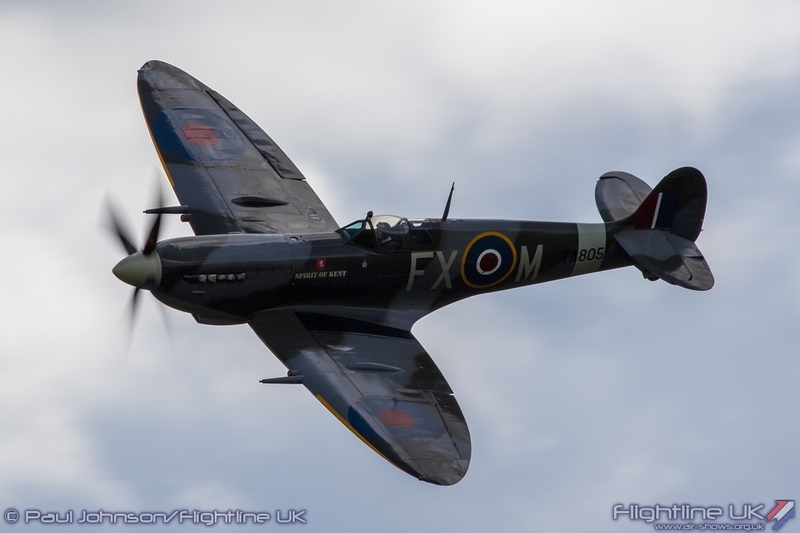 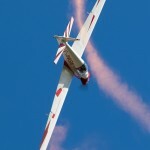 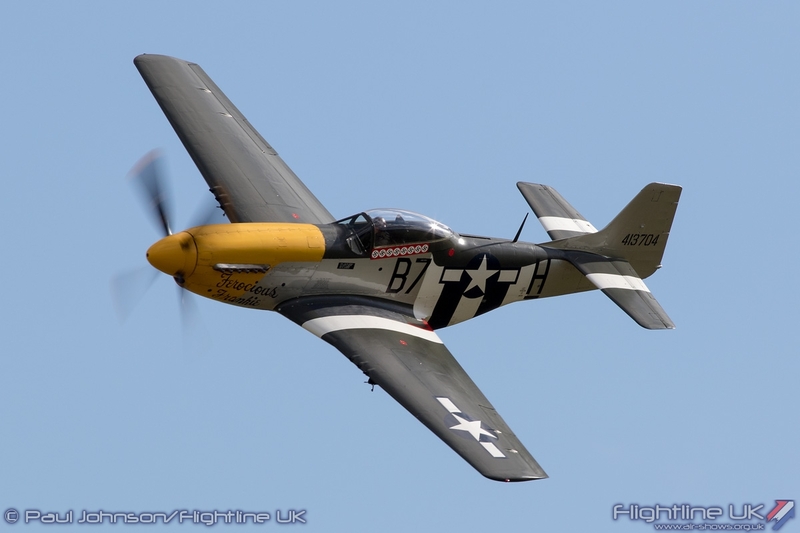 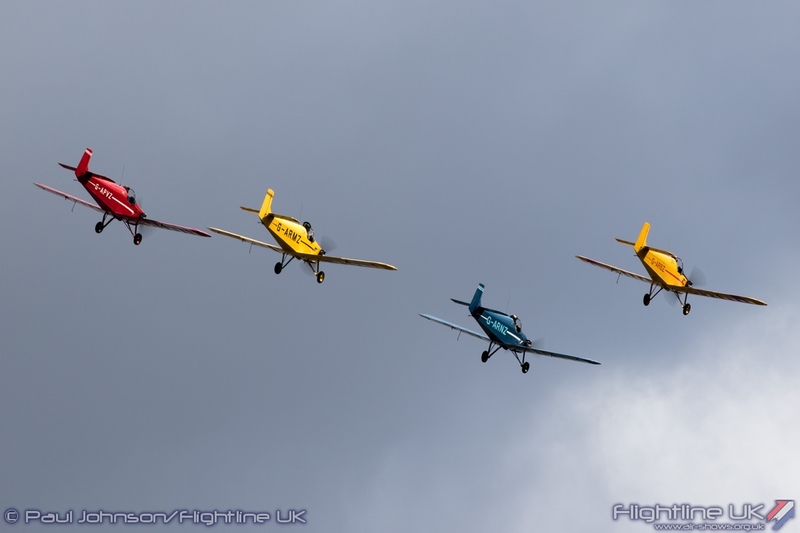 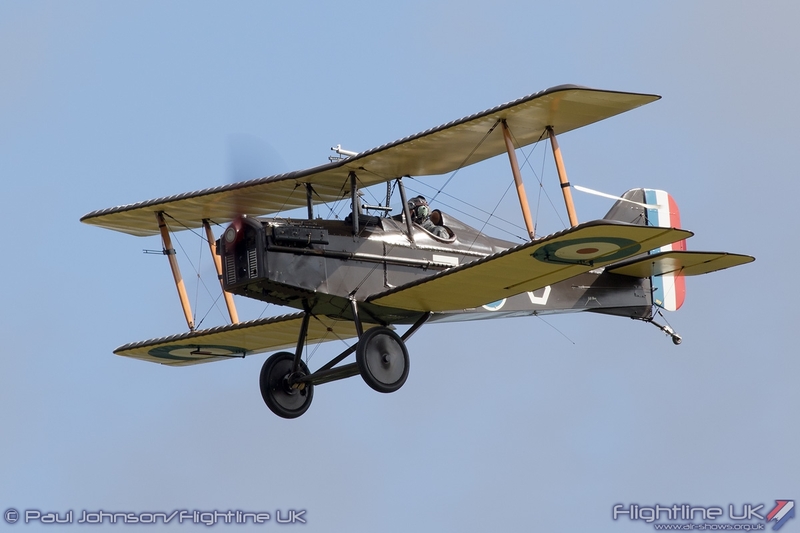 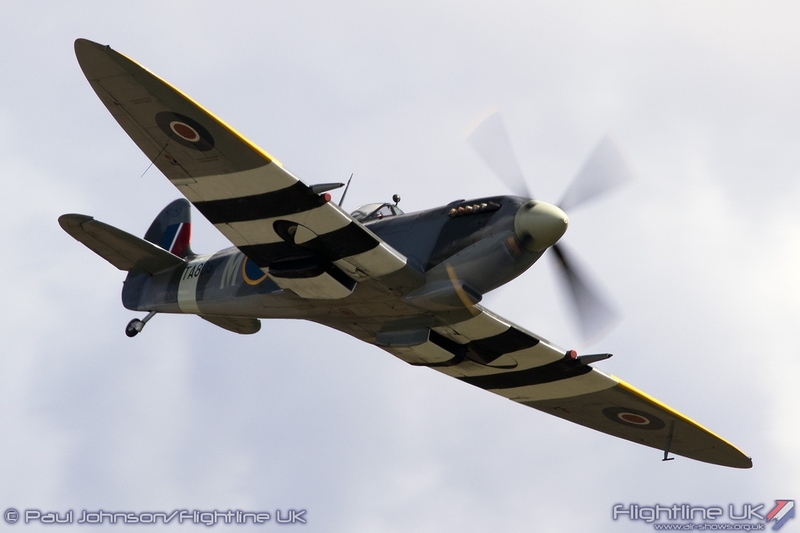 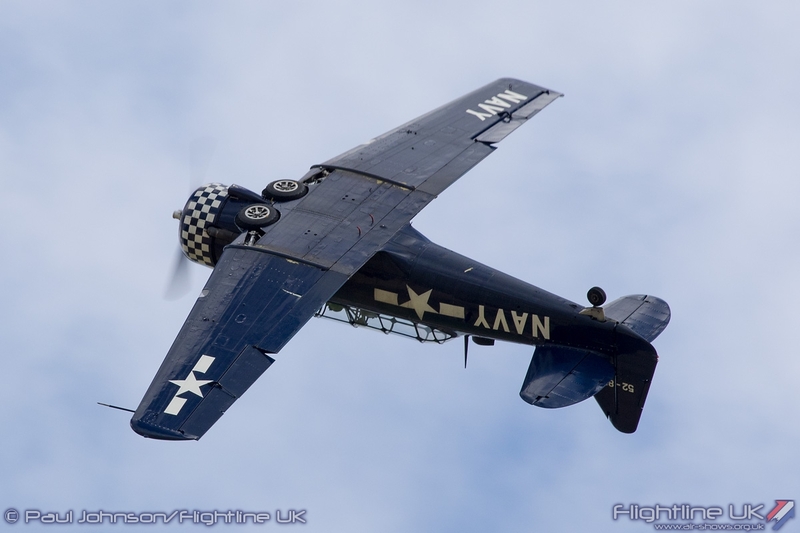 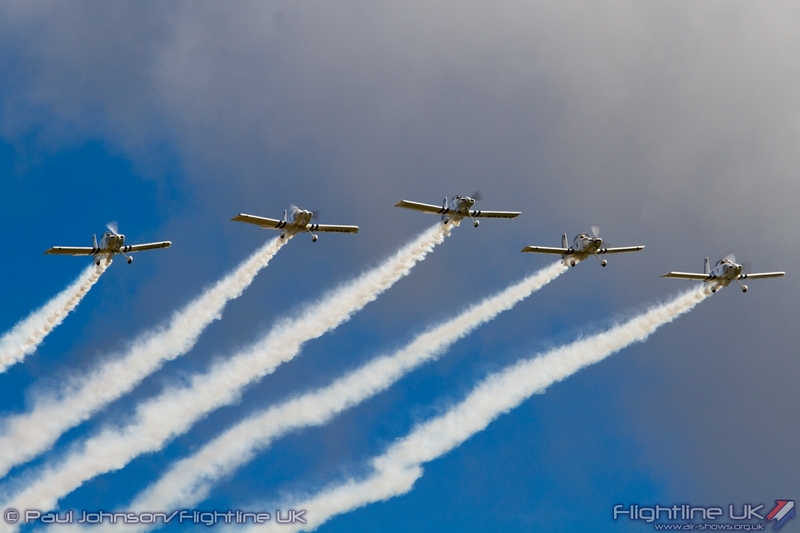 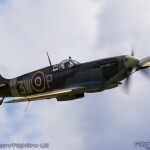 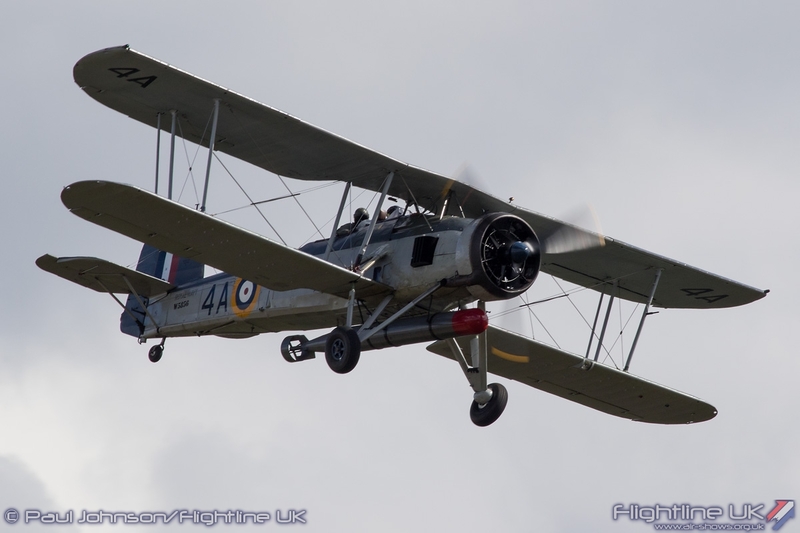 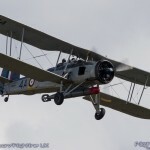 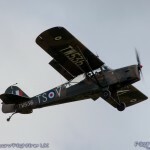 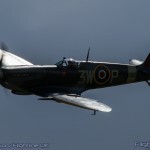 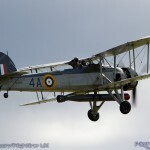 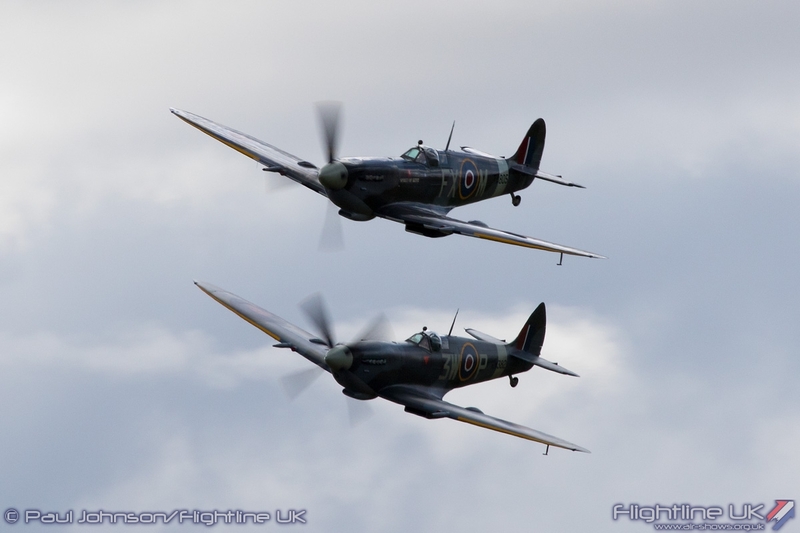 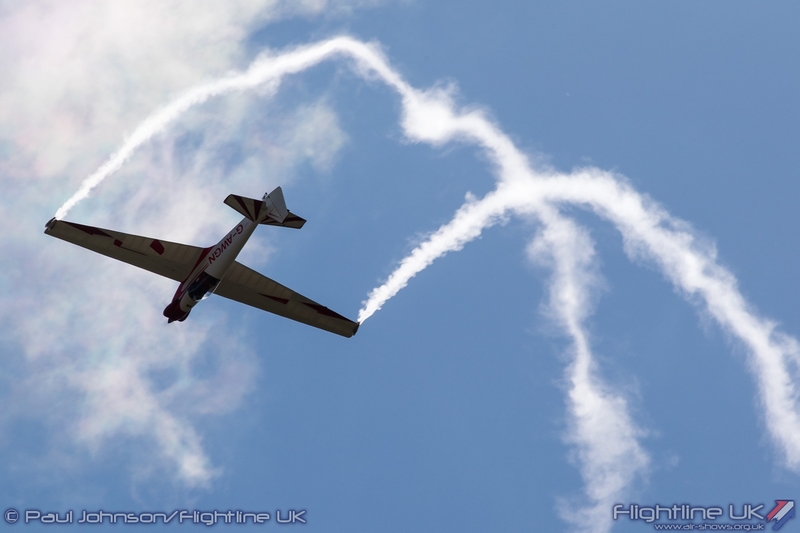 Organised by Slipstream Events, a long time supporting organisation of UK airshows, the Old Sarum event brought together many of the most popular civilian display acts for relaxed and fun afternoon flying display over two days. 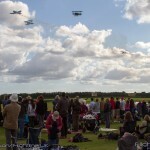 Perhaps the biggest draw of the weekend was to have been the Vulcan which was also supporting the Goodwood Revival. 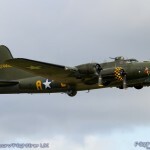 It had been planned for the Vulcan to appear together with B-17G Flying Fortress on the Saturday of the event but sadly a last minute technical snag with the Vulcan’s fuel system meant the aircraft had to make a return to its home at Doncaster before it was able to appear leaving everyone disappointed. 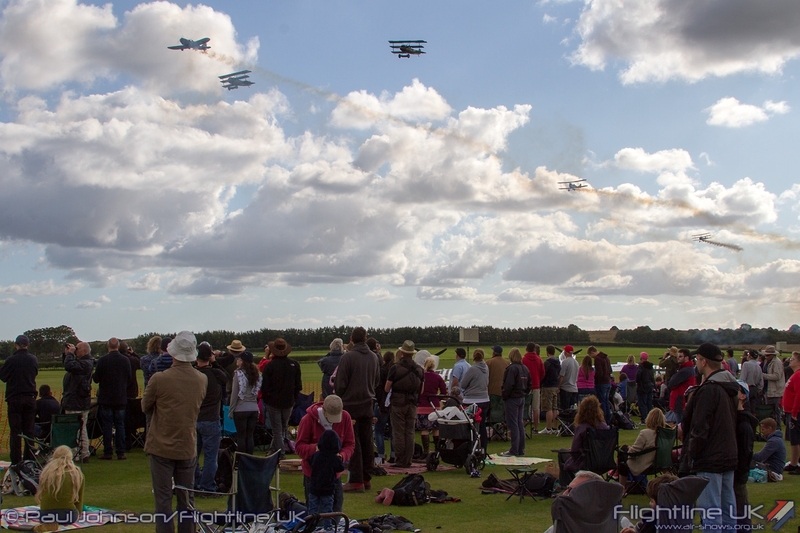 The promise of the Vulcan had drawn a very full crowd on Saturday with Sunday being less well attended. 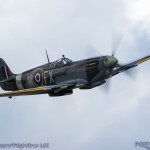 Sadly for the organisers, they were badly let down by a catering contractor meaning there were very few outlets for food and drink throughout the day. 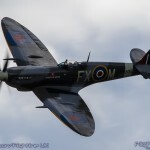 The airfield’s café, the two ice cream vans and the two outlets that did attend were swamped throughout the day on Saturday. 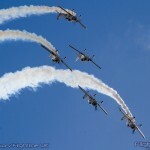 Full credit to them though for coping and proving that the absent contractor missed out on a good day of business! 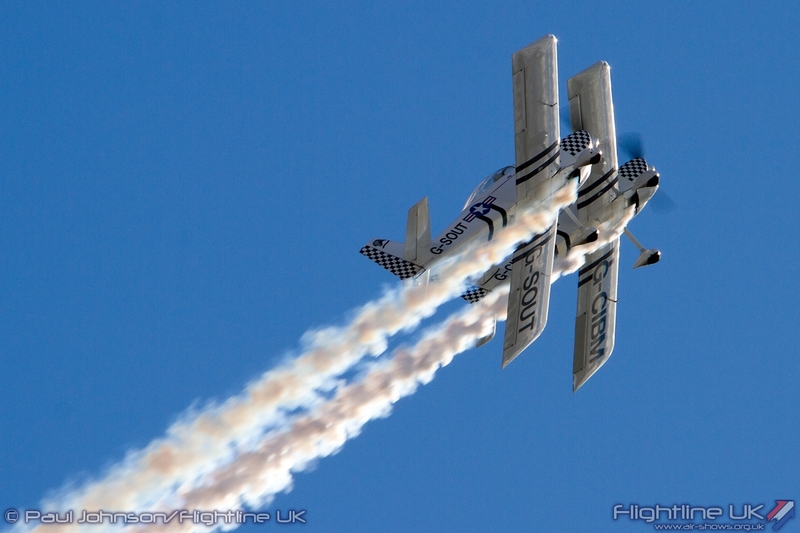 In many way this felt like an “airshow unplugged” being really stripped back to the barebones. 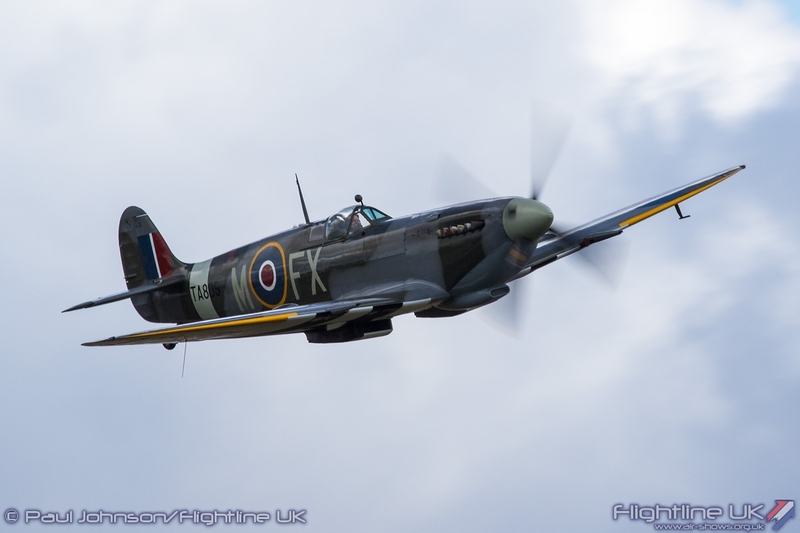 There were precious few traders or other distractions apart from the Boscombe Down Aircraft Collection which is now located at the airfield. 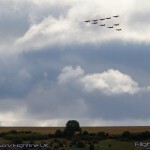 The morning saw many of the display aircraft arrive and even a somewhat distant appearance by the Red Arrows as they ran in for a flypast over an event at nearby Middle Wallop. 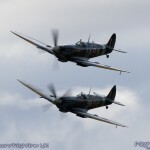 Opening the flying were a pair of Supermarine Spitfire XVI and IX from the Biggin Hill Heritage Hangar and flown by Dan Griffith and Richard Grace. 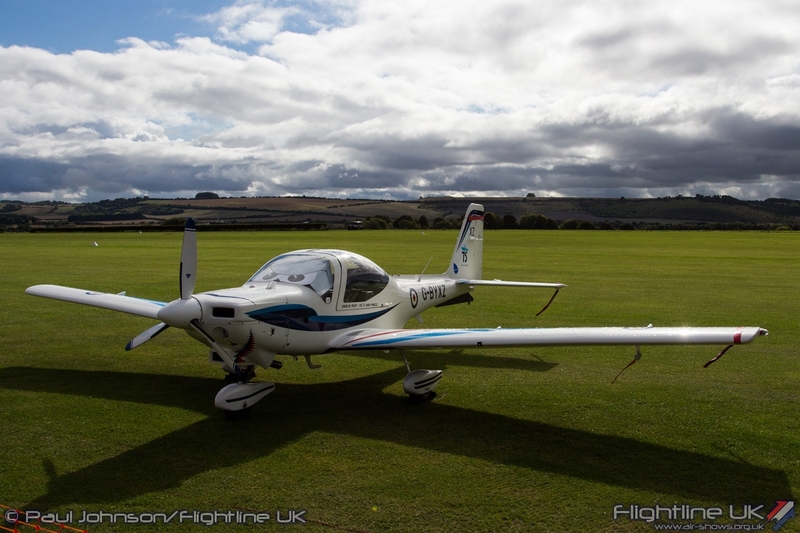 Dan opened the sequence with a smooth flowing solo routine before being joined by Richard for an exciting tailchase sequence over the rolling hills of Wiltshire. 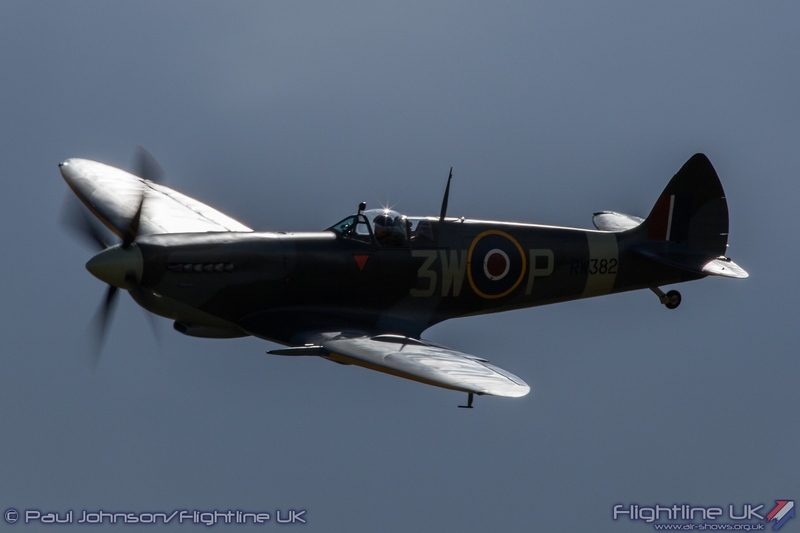 Richard completed the Spitfire display with a short solo in the Mk.IX. 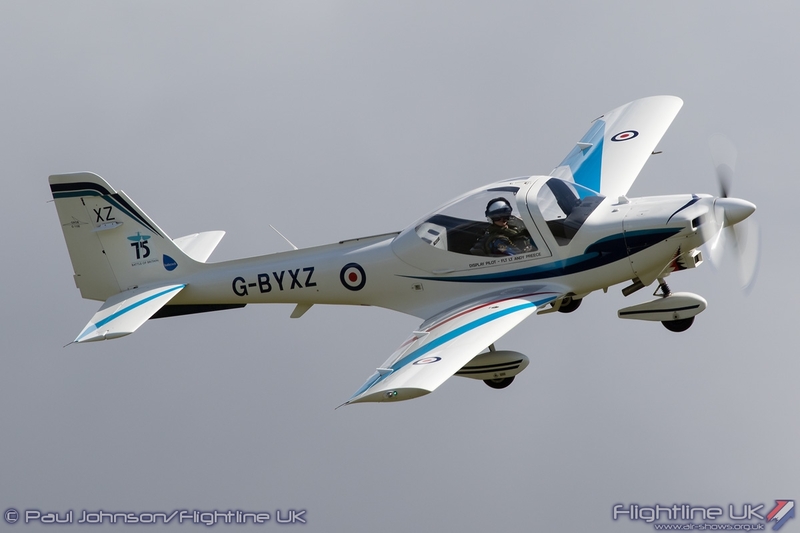 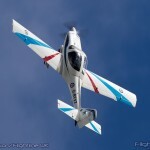 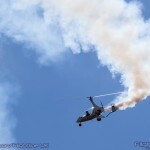 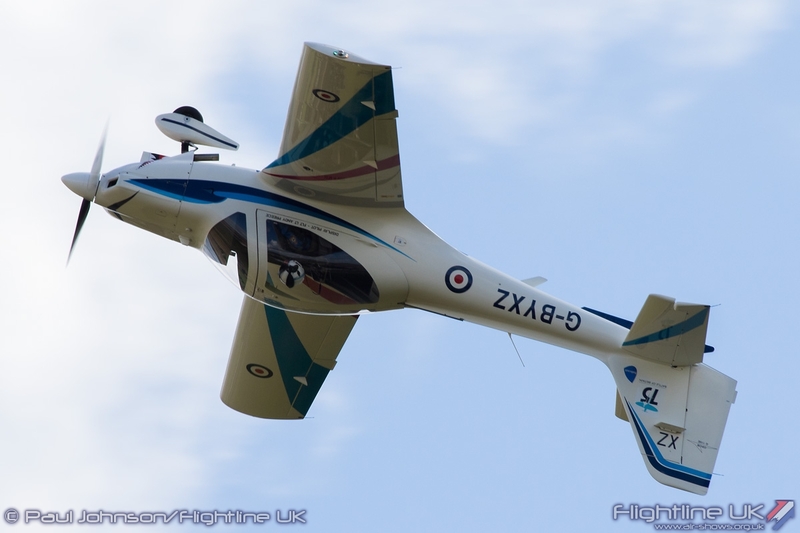 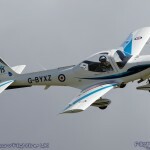 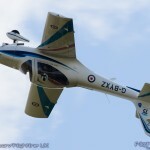 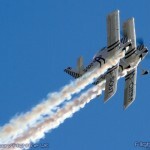 The only modern military flying display of the weekend was the Grob Tutor T1 flown by Flt Lt Andy Preece. 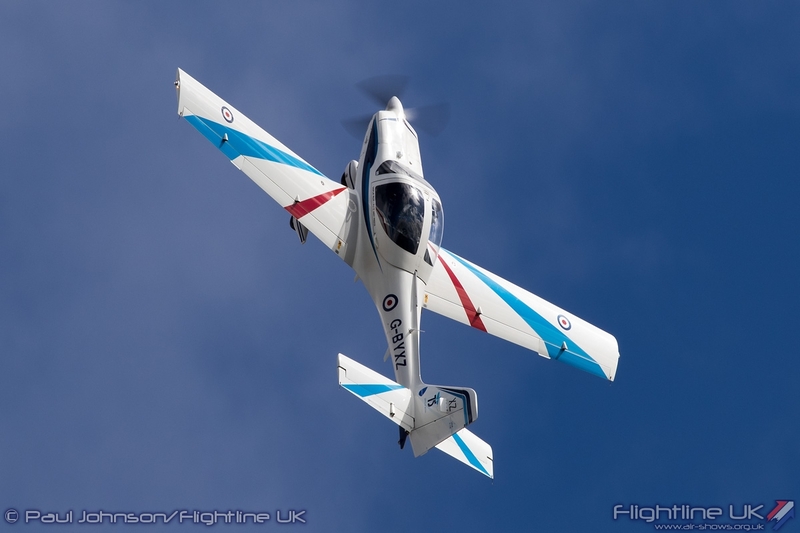 Sadly, next year there will be no Tutor display which is a great shame for venues such as Old Sarum where the RAF’s elementary trainer is just a about the only aircraft that can operate from the grass strip. 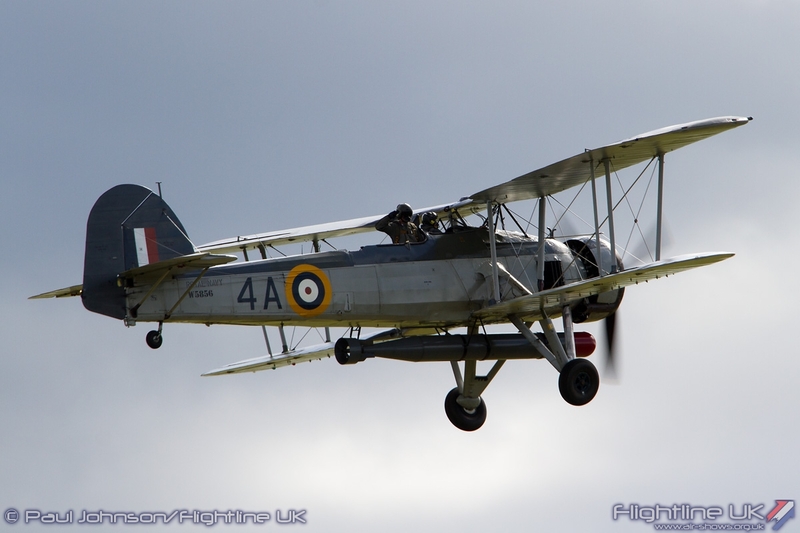 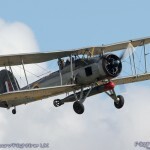 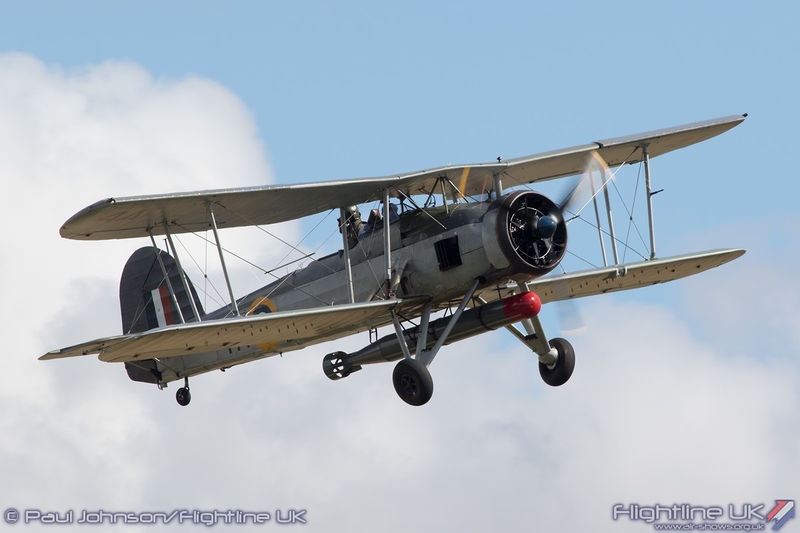 The Royal Navy were also involved with the Historic Flight’s Fairey Swordfish I making the short hop over from RNAS Yeovilton. 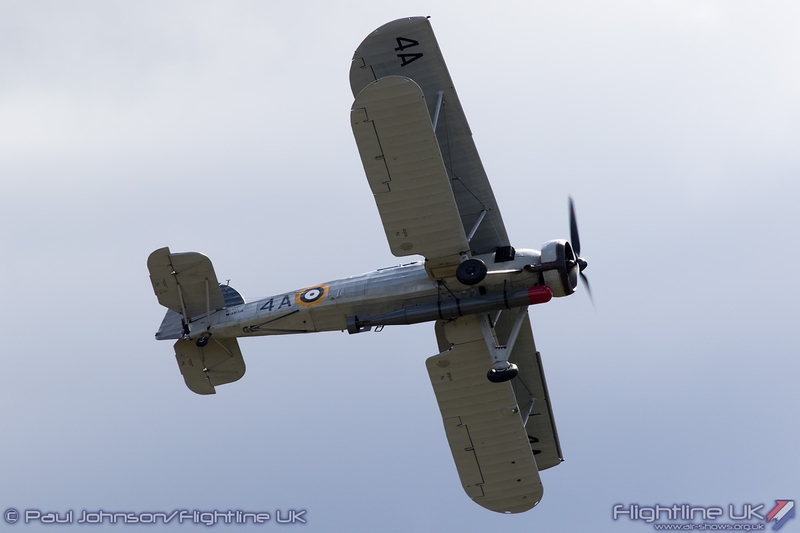 It really is great to see a ‘Stringbag’ back in the skies and we hope next year that the RNHF are seen much more widely. 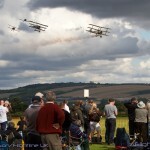 Old Sarum brought together a very diverse range of civilian aerobatic acts. 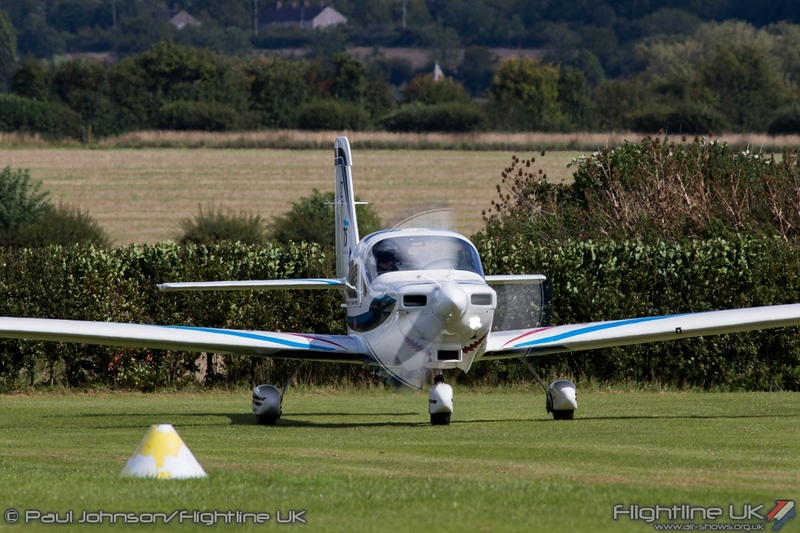 Bob Grimstead has made a very welcome comeback to the display circuit with his Fournier RF4D. 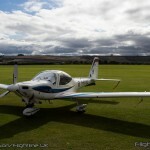 Bob has spent the last few months lovingly recovering and refurbishing his beloved RF4D and it looks as good as new. 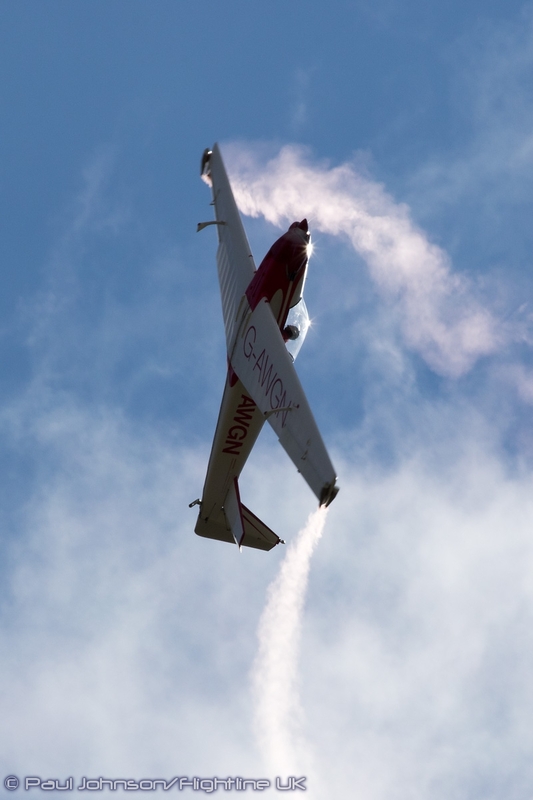 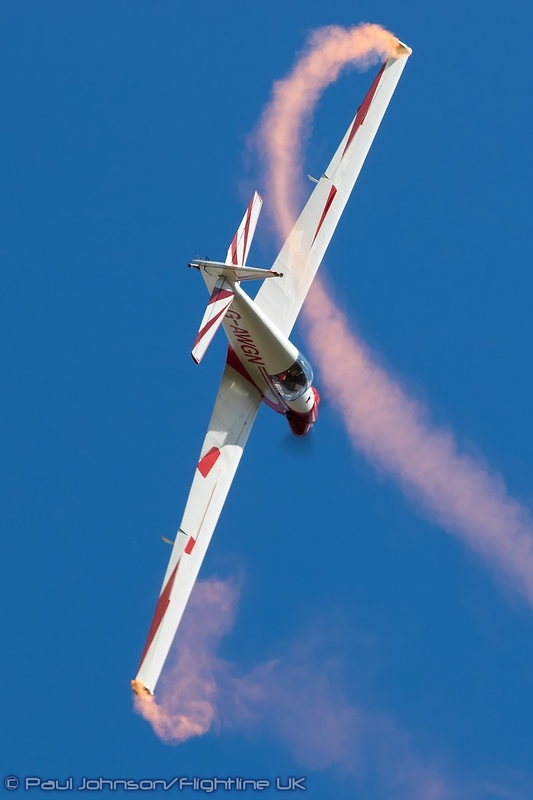 With little power available, Bob’s display is all about energy management and is a wonderful aerial ballet of flowing aerobatics highlighted by delicate wingtip smoke trails. 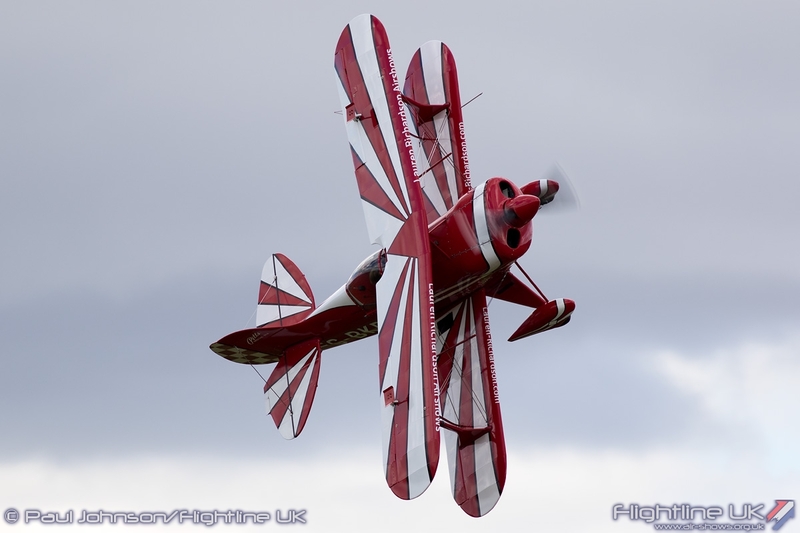 Further up the performance scale is the Pitts S-1S Special flown by Lauren Richardson. 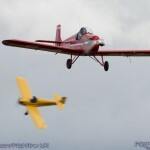 The small single seat Pitts is another classic shape at UK airshows and Lauren put a very fine display of precise aerobatics, making great use of Old Sarum’s unique topography for her final passes. 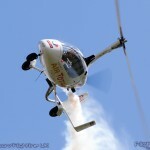 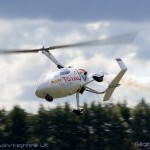 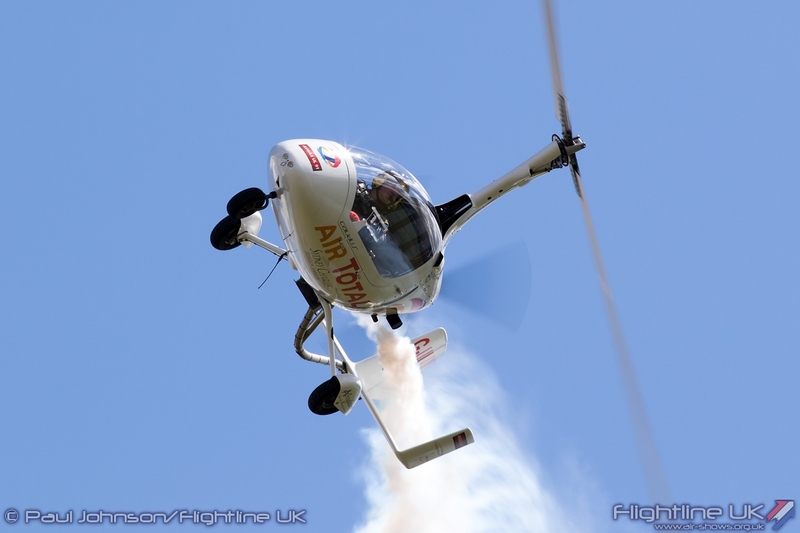 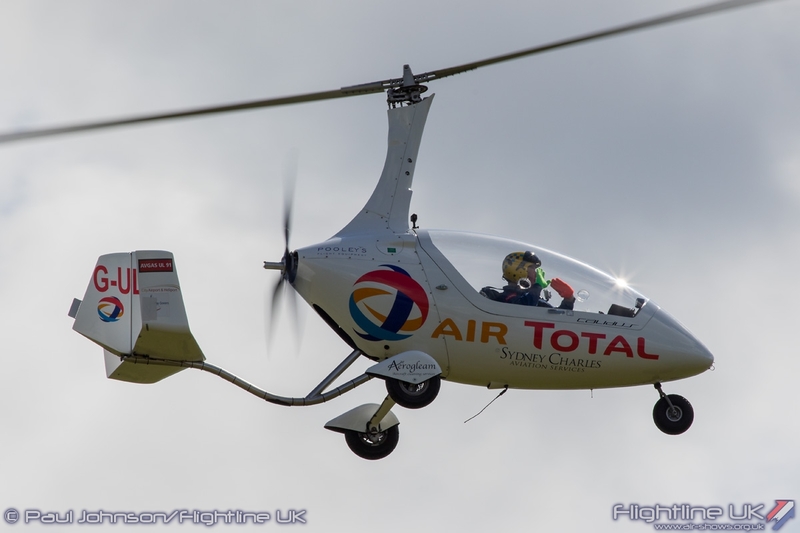 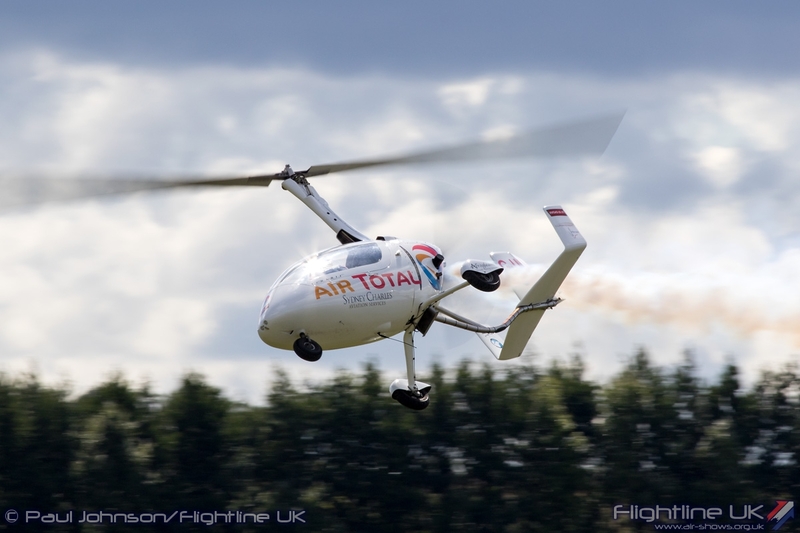 Peter Davies and his Calidus Autogyro are one of the true stars of the airshow circuit. 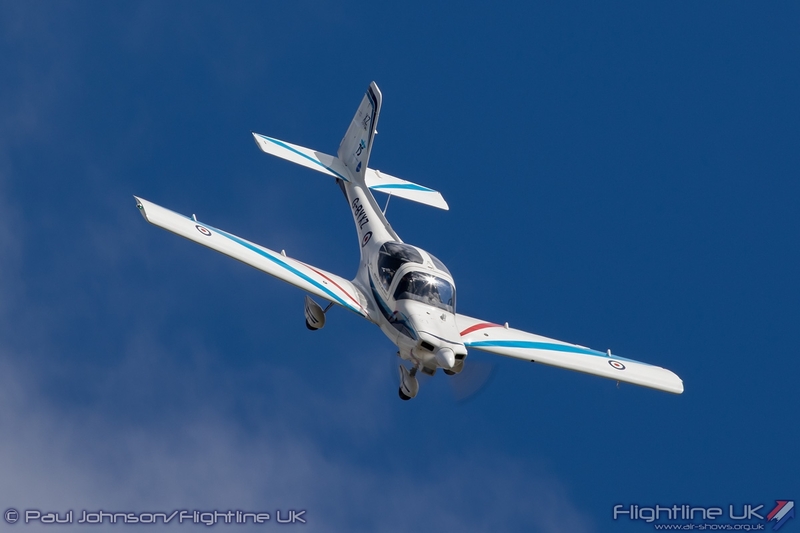 Despite the Calidus’ small size, Peter always puts on a superb display at venues large or small showing off the incredible agility and flying characteristics of the unusual aircraft in dramatic style. 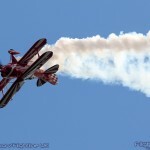 Adding “big team” elements to the afternoon were Team Raven and The Turbulent Team. 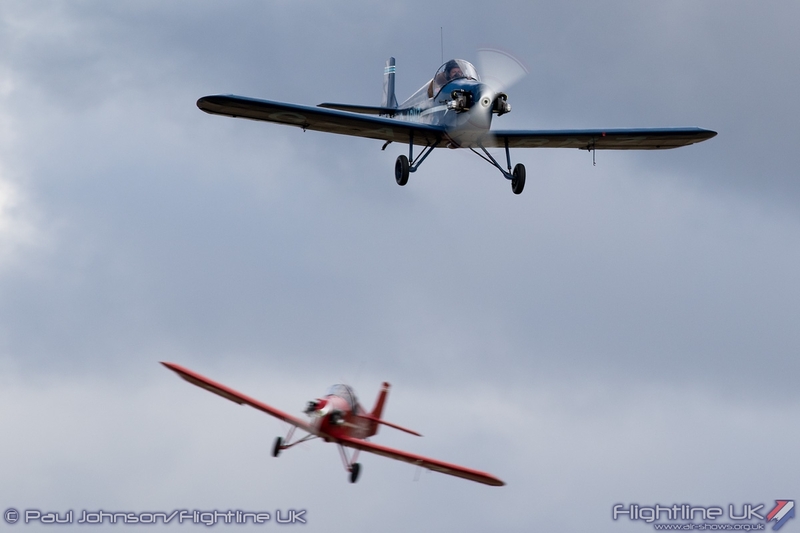 Team Raven fly a Vans RV4 and four of the slightly bigger Vans RV8 homebuilt aircraft which are fast, yet quite cheap and easy to operate. 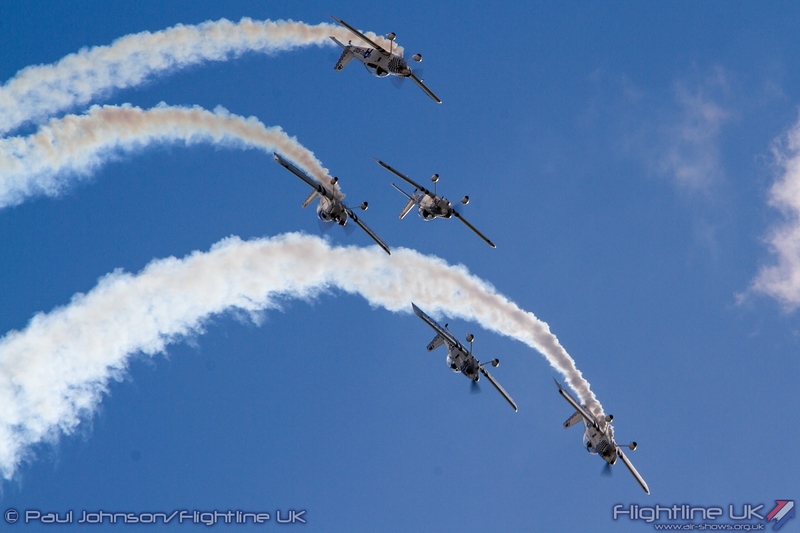 The team are actually formed by former members of a Yak-52 based team called Team Osprey and the classic jet based Team Viper. 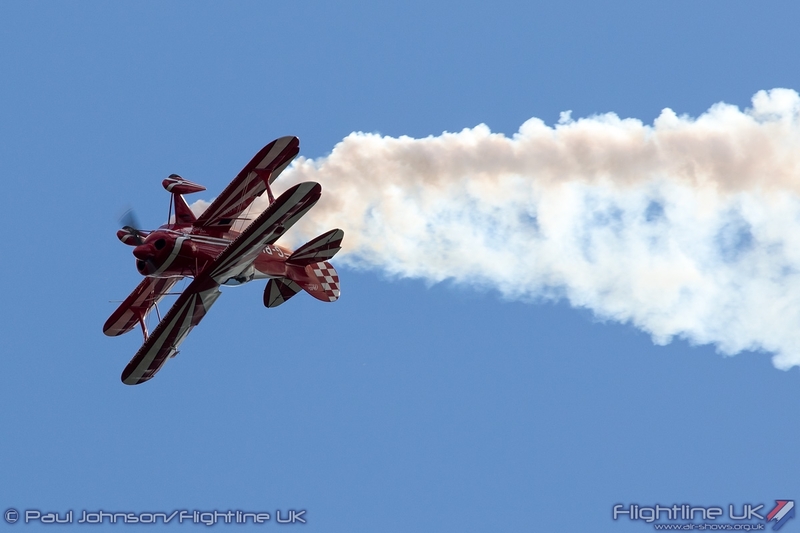 They have travelled far and wide in their first two years on the circuit performing an many UK and European airshows large and small. 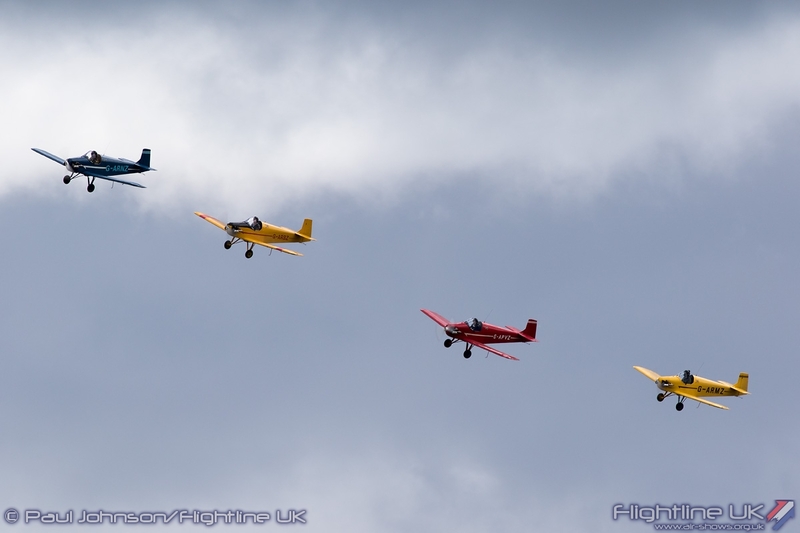 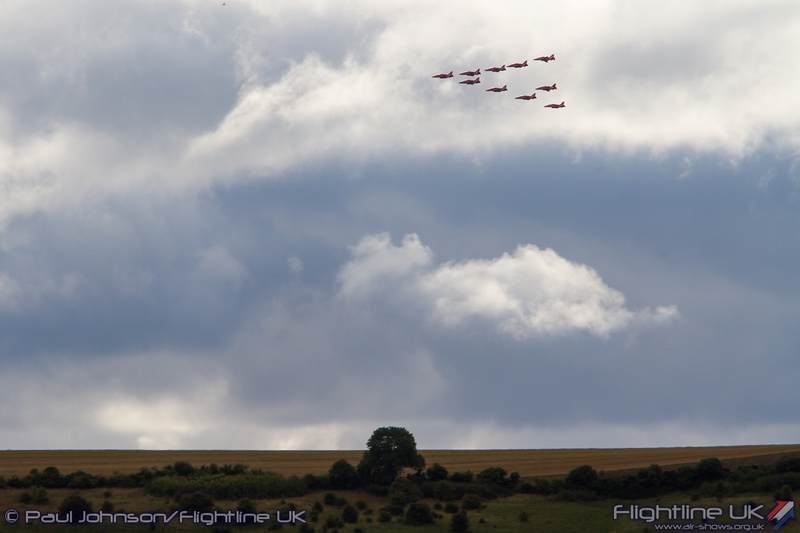 At a small venue like Old Sarum they quite literally filled the sky with their gentle mix of formation and synchronised aerobatics. 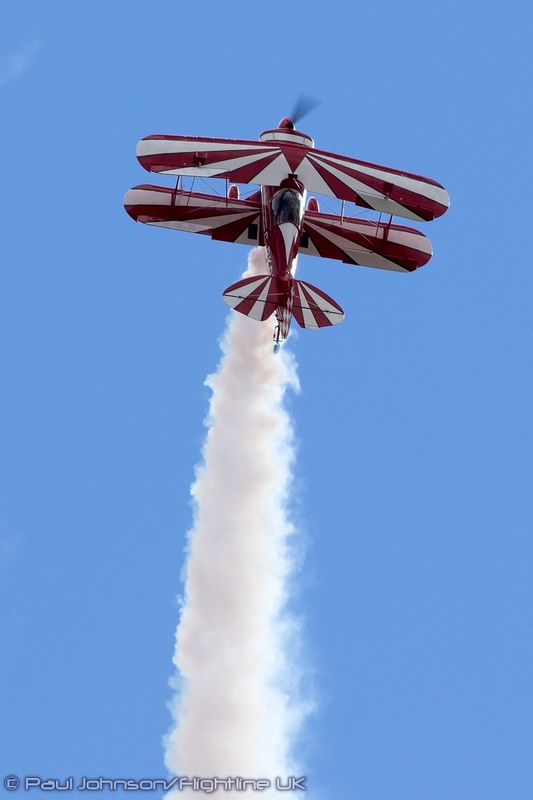 The Turbulent Team may be a much more familiar team, but their display was one of the high points of the afternoon entertaining the crowd with a great mix of flour bombing, limbo flying and balloon bursting that suited the small venue incredibly well. 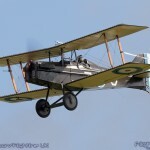 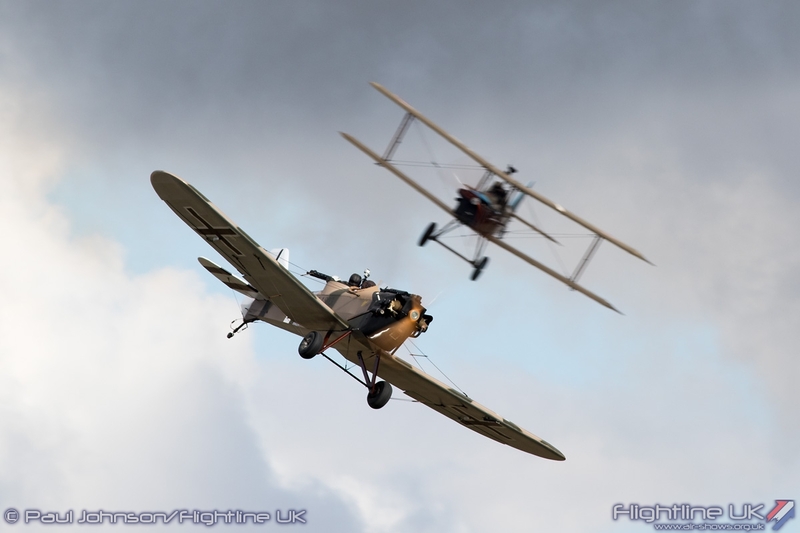 The Great War Display Team added yet more spectacle to the event with their recreation of the swirling dogfights of the Second World War with their faithful replica aircraft. 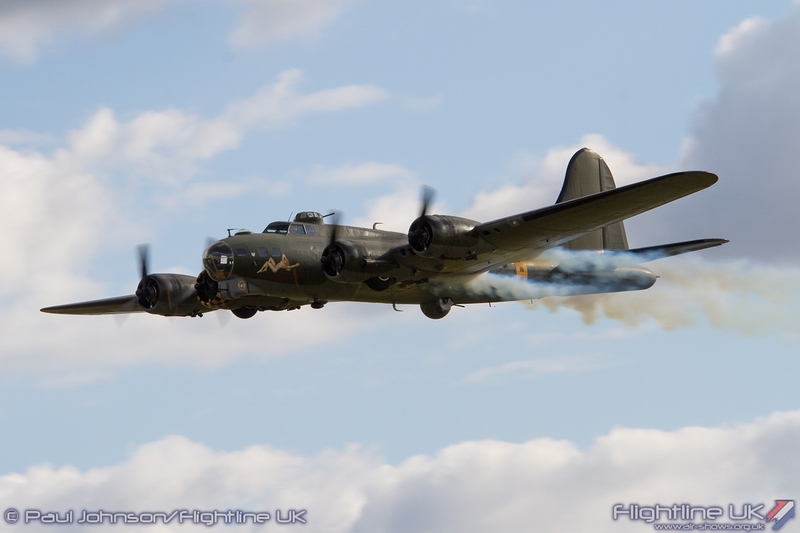 Supporting their display were some ground based pyrotechnics which caught many people off guard on the Saturday! 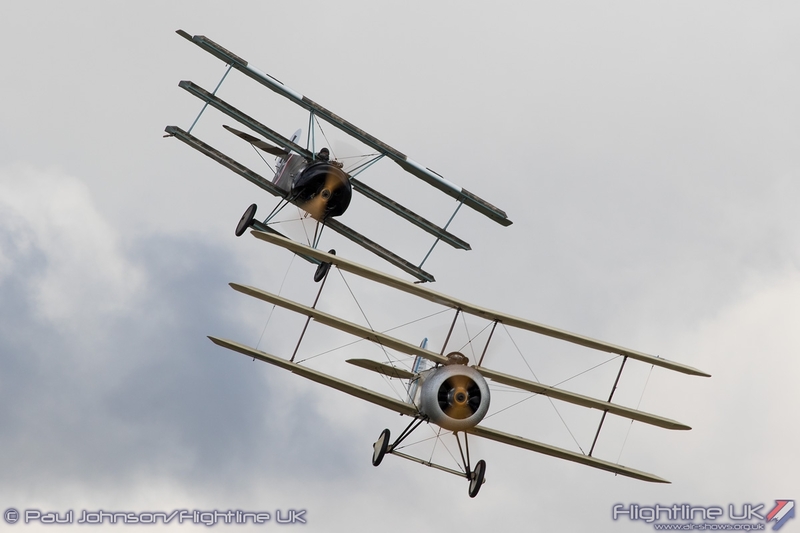 However, together it made for enthralling display. 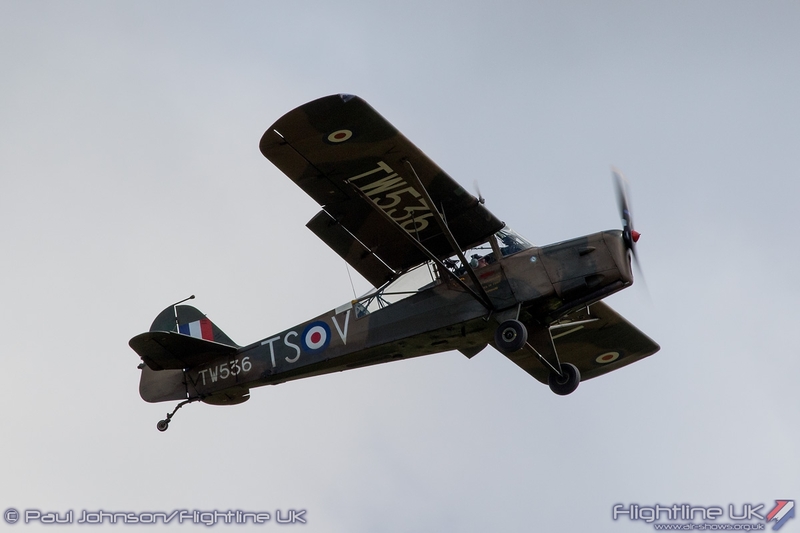 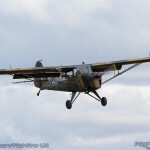 A nod to Old Sarum’s own history came in the form of the Taylorcraft Auster AOP6. 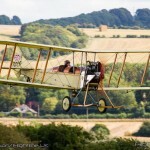 Old Sarum was a wartime base for the Army Cooperation Austers. 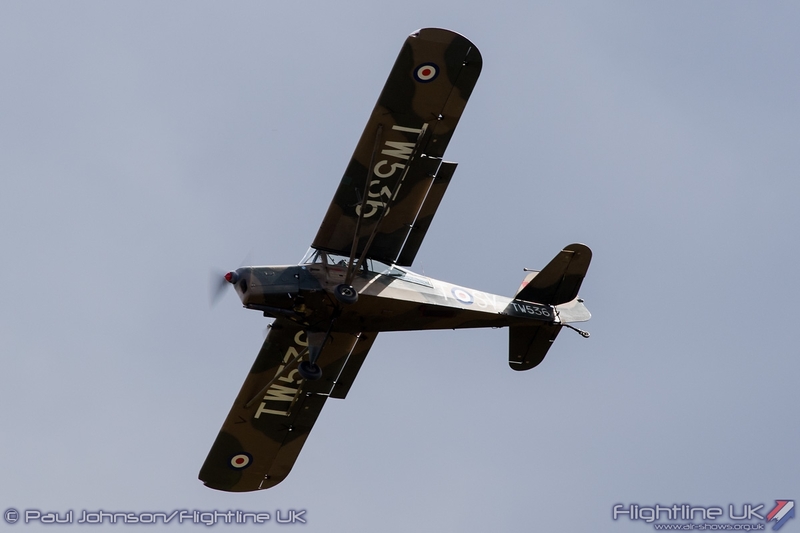 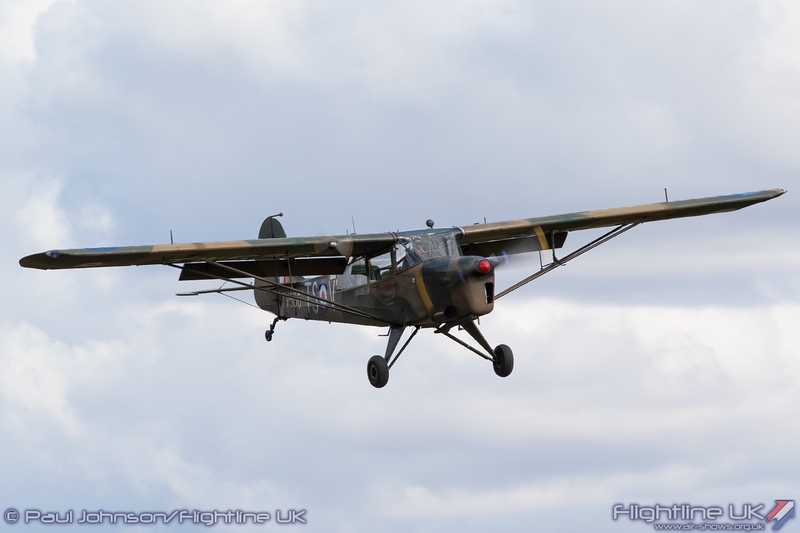 Flying the Auster was Kevin Hale who gave his first ever public display on the Saturday of the event and he did very well indeed showing off the slow flying capabilities of the aerial observation post aircraft. 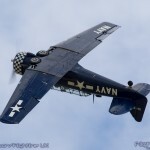 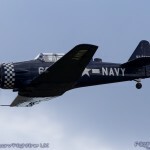 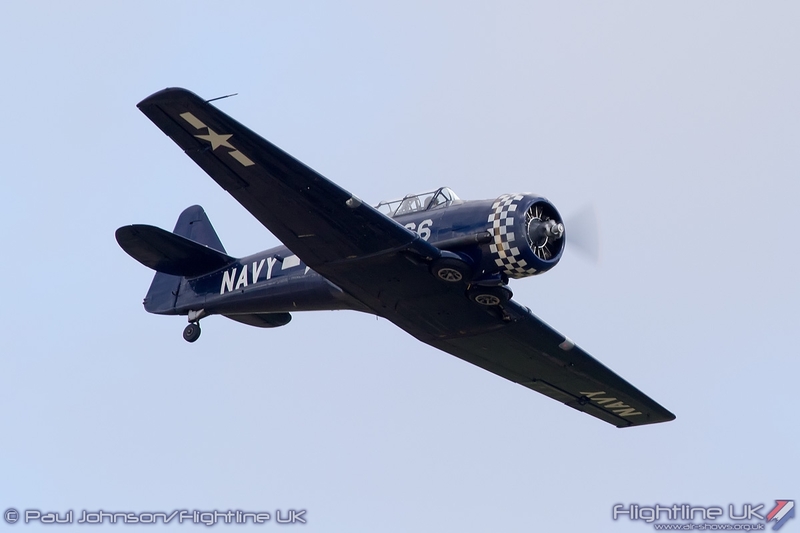 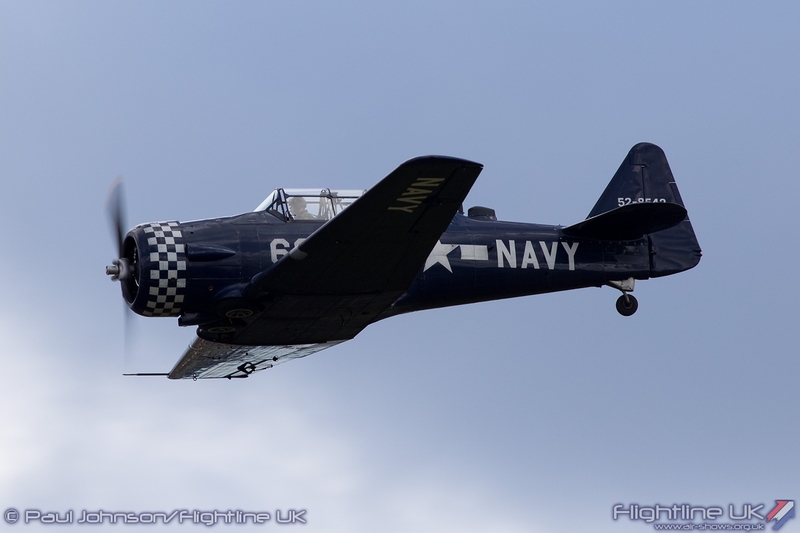 The North American Harvard was another type to operate from Old Sarum during the Second World War and a US Navy marked example was a late addition to the flying. 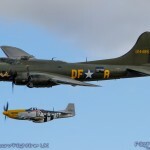 The America theme continued through to the end of the flying too. 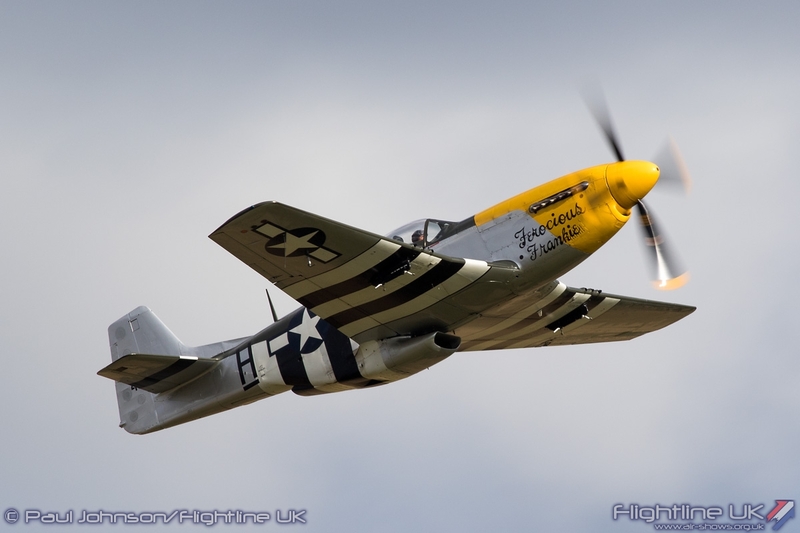 Current Red Bull Air Race World Championship Nigel Lamb gave a storming display in North American P-51D Mustang Ferocious Frankie. 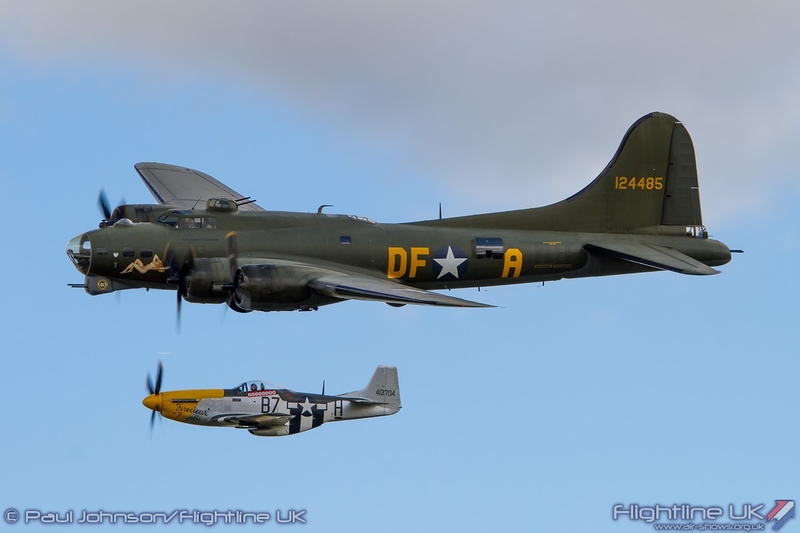 With the Vulcan cancellation, Nigel flew fast around the back of the display site on completion of his display to form up with Boeing B-17G Flying Fortress Sally-B for a formation flypast before the bomber’s own solo display. 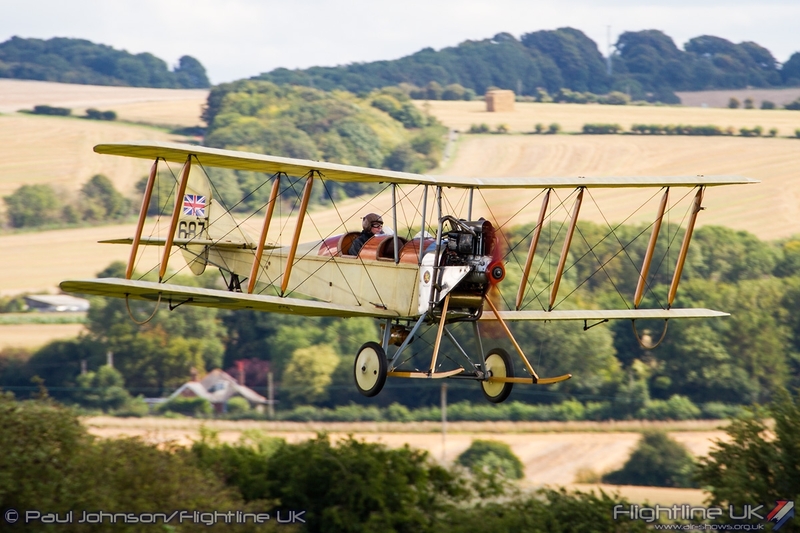 It was a fitting end to a great opening day at Old Sarum. 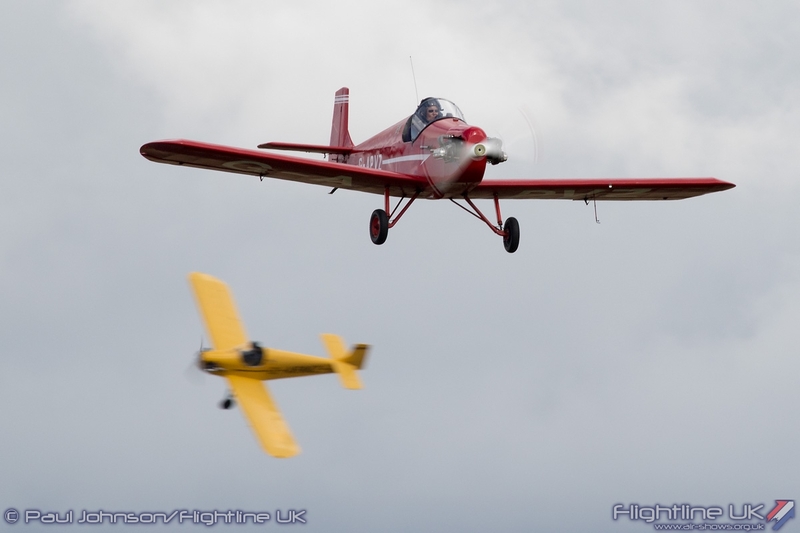 Sunday’s show continued in similar vein, but enjoyed additional displays from a Bucker Bestmann from Axis Air Displays and Peter Teichman in his Curtiss P-40M Kittyhawk. 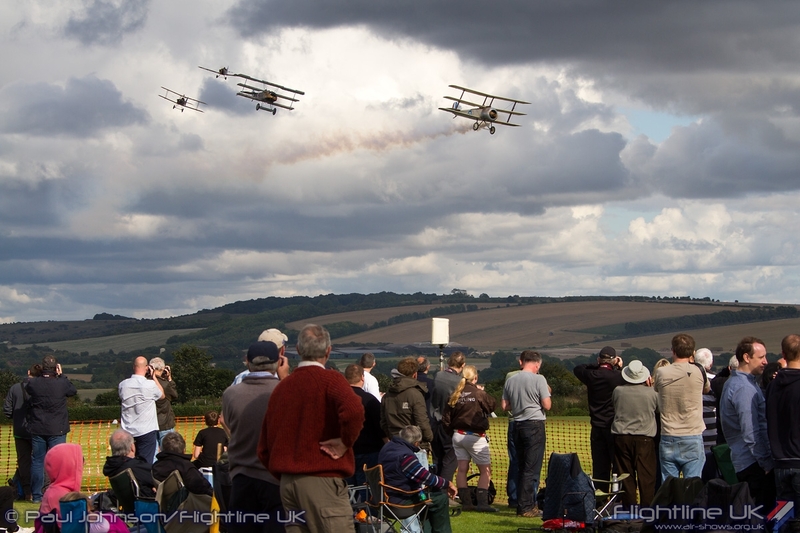 We hope the Old Sarum Airshow returns next year to become a permanent feature of the display calendar. 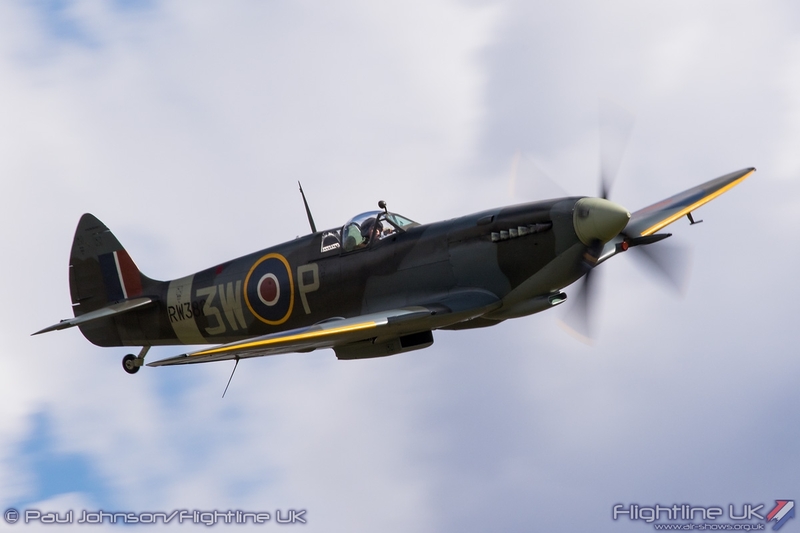 Despite the teething issues the event experienced this year, it is a beautiful venue for a flying display and certainly an event with great potential.